Ensuring the affordability of water tariffs in the future. Tariffs are expected to increase in the coming years, since €290 million of annual investments are planned until 2022. With potential water and sanitation expenditure representing more than 3% of the average income of the bottom 40% of the population (Authors’ elaboration), the affordability of water tariffs will have to be carefully monitored in the future. Improving the availability of structured, reliable, and comprehensive data about the sector’s situation. In the absence of a regulator-sanctioned data collection, there are presently no structured and comprehensive information giving a clear picture of the sector. As a result, utility managers cannot assess whether their operation is at par with good practices. Addressing this challenge would help the sector move ahead. Improving the cost recovery level of services. Tariffs cover operation and maintenance costs but not capital expenditure. Within the context of important investment needs, improving the cost recovery level may be required, since EU cohesion funds and national subsidies may not cover all capital funding needs through 2022. MINZP. 2007-2014. State of the Environment Reports of the Slovak Republic 2005-2012. Bratislava: Ministry of Environment of the Slovak Republic. —. 2015. 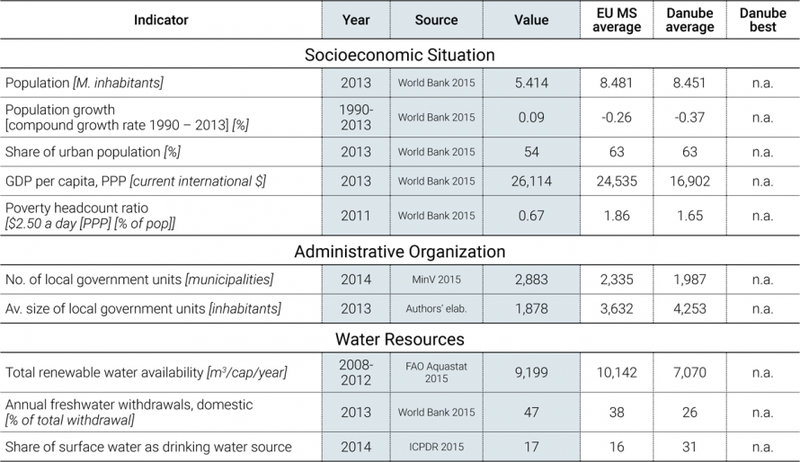 Ministry of Environment of the Slovak Republic: Enviroportal - Indicators for Water Services. http://www1.enviroportal.sk/indikatory/kategoria.php?kategoria=203. URSO. 2014. Report on Fulfilment of Quality Standards 2013. Bratislava: Regulatory Office for Network Services. Economy. Since the establishment of the Slovak Republic in January 1993, the country has undergone a transition from a centrally planned economy to a free market economy. The Slovak Republic is considered a high-income country. It has been an EU Member State since 2004, and adopted the euro currency at the beginning of 2009. The country has 5.4 million inhabitants according to the 2011 census, 54% of whom live in urban settings. The country is densely populated, with 110 inhabitants/km2. Economic growth is 2.5%, but the unemployment rate is relatively high (around 13%), and around 14% of the population lives below the poverty line (with 0.67% living on $2.50/day). The Roma population is generally considered a vulnerable minority, but the official estimate (2% according to the 2011 census) remains far below their real number (which is as high as 8%) (World Bank 2015). Water resources. The Slovak Republic is a landlocked country, a particularity of which is that almost all its water flows out of its territory toward neighboring countries. About 96% of the water flow via the Danube and its tributaries to the Black Sea and 4% via the Wisla River over Poland to the Baltic Sea. Renewable water sources depend entirely on precipitation. According to the water balance, on average over the last 4 years, 340.47 Mm3 of groundwater and 275.46 Mm3 of surface water have been abstracted each year. The average volume of renewable water resources (internal river flows and groundwater from rainfall) is 9,199 m3/capita/year (FAO Aquastat 2015). The government has approved an adaptation strategy to tackle the adverse impacts of climate change, and has developed indicators of drought and water scarcity, risk maps, and drought management plans. Moreover, the entire country is declared a “sensitive area” in the sense of the EU Water Framework Directive (WFD) (MINZP 2014b). Water supply sources. Water for drinking purposes comes predominantly from groundwater sources (83%) (ICPDR 2015). Watercourse and water resources management is based on hydrologic basins. Water resources management is fully in compliance with the global trend as to Integrated Water Resources Management. Principles of water management are contained in the “Water Plan,” which integrates plans for the Wisla and the Danube basins. Any surface water or groundwater abstractor must obtain a permit from the water authorities. Payments and charges for surface water extraction, including the payment mechanism, are determined by law. Any entity discharging wastewater into surface water or groundwater must obtain a permit from the water authorities. Compliance with permit conditions is monitored by the river basin manager or the water authority that issued the relevant permit under the supervision of the Slovak Environmental Inspectorate. These institutions are entitled to impose sanctions in case of noncompliance. Service provision. 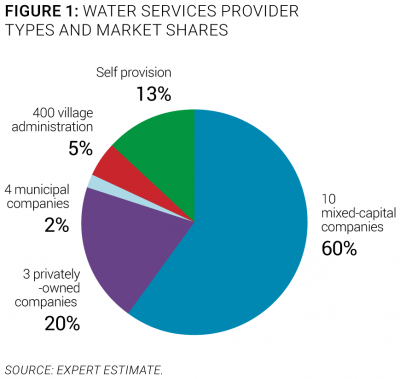 Municipalities as asset owners are responsible for water services provision. The most dominant model is the mixed-capital operating company in which municipalities own the majority of shares. The Fund of National Property of the Slovak Republic or utilities themselves can be shareholders, but their shares represent 2% to 9% of the capital. Those entities own the service assets. 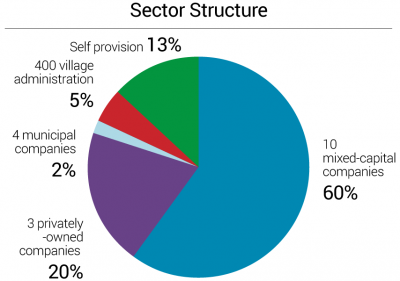 Ten mixed capital companies provide services to 60% of the population. Only 3 privately owned companies (separate model) provide service to 20% of the population, on the basis of long-term concession contracts. Another 4 purely municipal companies render services to 2% of the population, and 400 village administrations provide water to 5% of inhabitants living in rural areas. The remaining inhabitants rely on self-provision (13%). All utilities provide both water and wastewater services (Figure 1). The private sector is represented in a separate model by the multinational groups Veolia and Suez Environment (Expert estimate). The Ministry of Environment (MoE), which is the line ministry responsible for water sector policy and water management. It is specifically in charge of water resources management, river basin management, flood protection, water quality and quantity preservation, and water supply and sanitation. The Ministry of Health (through the Public Health Authority), which, in cooperation with MoE, is responsible for drinking water quality control. The Regulatory Office for Network Industries (URSO), which is responsible for pricing policy, price regulation, and protection of end-consumers. It sets price to ensure investment return for business entities. It also establishes the provision conditions of network services, including service quality standards. Capacity and training. Water and wastewater utilities implement continuous staff training programs. Utilities organize staff capacity building as an integral part of human resource management and policies. International groups (Veolia, Suez) involved in the Slovak water sector also play an important role in developing staff training for all levels of managers through well-established human resources principles. Some utilities cooperate with universities on studies and pilot projects. The Association of Water Companies (AVS), created in 2004, provides technical and economic advisory services to its members, as well as knowledge exchange activities (workshops, conferences, journal). It also organizes training targeted at water sector professionals. Slovak utilities are generally considered stable employers, and technical staff turnover is relatively low. Municipal political cycles sometimes influence top-level manager turnover. Economic regulation. The water sector has been regulated by a national regulatory authority, the Regulatory Office for Network Industries, since 2001. The office also regulates the electricity, gas, and heat sectors. The Regulatory Office does not answer to state authorities, and performs its duties impartially and independently. The regulator determines the regulated price through either (a) direct determination of a fixed price, (b) direct determination of a maximal price, (c) definition of a mechanism for fixed price calculation, (d) definition of a mechanism for maximal fixed price calculation, (e) definition of economically justified costs and reasonable profit, or (f) the use of market measures (e.g., auctions). The regulator proceeds according to the regulatory strategy over the regulation period. Tariffs are determined according to a price-cap methodology for a regulatory period of 5 years (currently 2012-16). The regulator also establishes and monitors service standards, and imposes compensation payments to customers in case of noncompliance with the defined standards. Ongoing or planned reforms. The water and sanitation sector is a stable and mature sector for which no major legislative change is expected. The sector should, however, be indirectly affected by the transposition into Slovak law of the new EU legislation (the new Procurement Directives) and implementation of the Operational Program for Environment. Severoslovenské vodárne a kanalizacie, a.s. is a joint-stock company. Municipalities from the region own and control the water company. This is an example of a functional and successful model of the ownership and operation of infrastructure. The company has a long-term recovery plan for infrastructure, providing open and transparent information to its shareholders and customers, while implementing numerous projects financed by EU funds. http://www.sevak.sk/. Service coverage. The Slovak Republic enjoys full access to water and sanitation services. According to national statistics, 87% of the population is connected to public water systems. The rest of the population uses their own wells. Around 62% of the population is connected to public sewerage systems (MINZP 2014b). Equity of access to services. All populations have access to water regardless of their social or ethnic status. Indeed, 100% of the poorest share of the population (living on less than $2.50/day) has access to a piped water supply. However, only 66% has access access to flush toilets (Figure 3). In some regions of the Slovak Republic, segregated Roma communities have access to public water and sanitation facilities. Service infrastructure. Technical and operational conditions of assets are considered satisfactory with regard to the reliability and quality of service provided by utilities. There are 255 WWTPs for municipalities over 2,000 population equivalent (PE), and 241 of these facilities comply with EU Urban Wastewater Treatment Directive requirements (MINZP 2014a). All 95 large water supply zones (above 5,000 inhabitants or more than 1,000m3/day) and the associated water treatment plants meet the EU Drinking Water Directive. The reliability of water pipelines is high in terms of continuity of supplies. However, long-term efforts should generally be put into renewal of infrastructure to achieve sustainability of services together with full cost recovery. Quality of service. The quality of water and wastewater services in the Slovak Republic is generally very high. Water supply is continuous 24/7, with necessary water pressure, and collection of sewage is also continuous (IBNet 2015). Drinking-water quality is fully in compliance with national and European standards, and only 0.65% of samples exceeded maximal limit values (MINZP 2014b). No EU derogation has been granted. The quality of wastewater discharged is monitored and independently measured by authorities, and penalties are levied whenever effluent limits are not met. In some cases when operation management contracts have been concluded, a set of performance indicators, including quality monitoring, have to be reported on by the operator. However, customers are not publicly informed about those indicators, nor are they displayed on the utility website. Customer satisfaction. The satisfaction of the population with the service provided in their city (as per a Gallup Poll) is correspondingly high at 82% (Gallup 2013). This number is significantly higher than in most countries of the region. Customer satisfaction surveys are not carried out at the national level, but regional and large municipal water companies do use customer satisfaction surveys and publish the results on their websites. Websites viewed for this note showed overall customer satisfaction and a proactive customer approach. Overall efficiency. Overall efficiency of Slovak utilities is relatively high, but some remaining issues need to be addressed. The volume of nonrevenue water is still high (32%) compared to the situation in Central Europe (MINZP 2013). This can be explained by an improvement in the accuracy of measurement and/or by a significant number of illegal connections. Utilities tend to reach higher levels of commercial and financial performance compared to technical and operational performance, since the latter are directly linked to the infrastructure state. It also seems that indicators related to status of infrastructure are a bit worse than the usual commercial and financial performance indicators of utilities. Staff productivity per 1,000 connections (7.7) is above international best practice (IBNet 2015). Recent trends. IBNet has shown both positive and negative efficiency trends in recent years. The collection ratio shows a steady increase during 2005-2012, rising to 116% in 2012. Slovak utilities faced negative factors that pushed them to be more efficient. For instance, average water consumption dropped over the last 10 years from 115 l/capita/day to 81 l/capita/day at the national level, with lowest consumptions reaching 70 l/cap/day (MINZP 2013). This consumption decrease is mainly due to a tariff increase within a context of full metering (Figure 4). Overall sector financing. 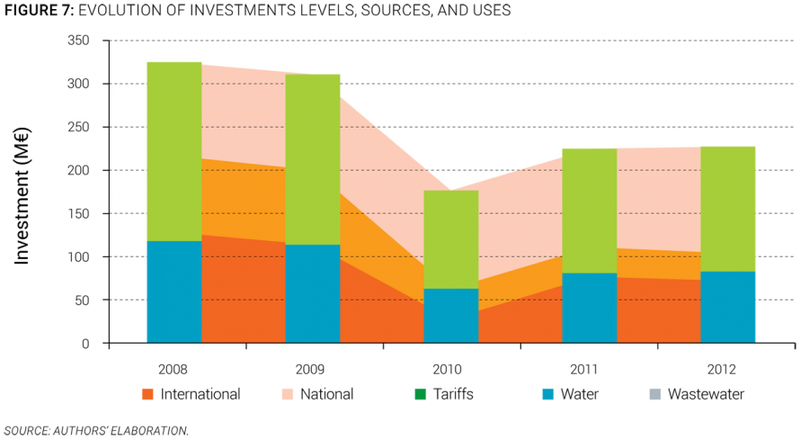 Tariffs are the only funding source that cover O&M costs in the water sector. There is no subsidy scheme or additional taxes or fees financing utilities to cover their O&M costs. Tariffs, including detailed tariff structure, are regulated, and only “economically justifiable costs” are to be taken into account in setting tariffs. Depreciation costs of the existing assets are the funding sources for infrastrcuture renewal investment. EU cohesion funds and other national subsidies are used only for new infrastructure investment. 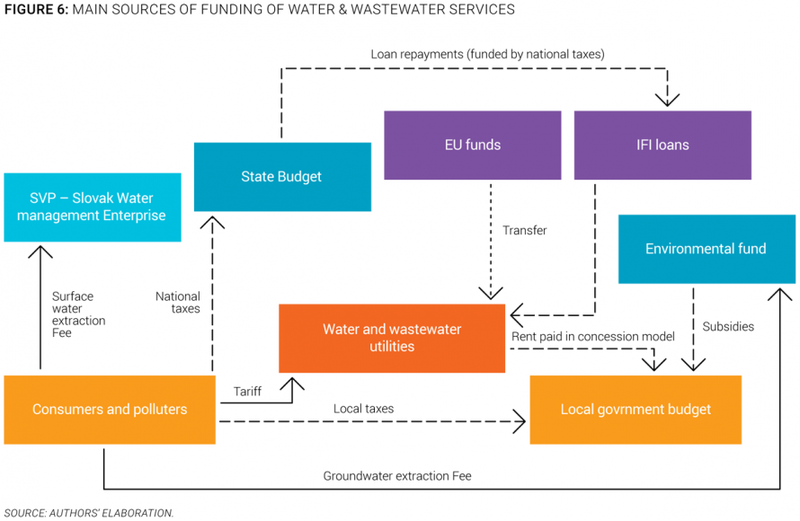 Water discharge and abstraction fees and taxes collected by the Slovak Environmental Fund are used to subsidize water and wastewater projects, but historically only for small municipalities (Figure 5 and Figure 6). Investment needs. The Slovak Republic has already complied with the EU directive for water, and is expected to do so for the wastewater directive. The Slovak Republic should fulfil in due time all Urban Waste Water Directive requirements, since all WWTPs over 2,000 p.e. should be in compliance by 2015. Commitments under the Drinking Water Directive have already been achieved. Investment strategy will address WFD obligations and objectives from the National Concept of Water Management policy, to ensure a smooth supply to residents and other customers of safe and good-quality drinking water and effective sewage disposal, as well as sustainable services through reliable infrastructure based on socially affordable tariffs with minimal support from public finance. It is estimated that around €53 per inhabitant per year until 2022 would be necessary to achieve the National Strategy objectives (Expert estimate). Investments. The infrastructure investment rate is relatively high. Around €42 per person has been invested every year (Author’ elaboration). The main objective of the investments is to meet European/Slovak standards mainly for wastewater collection systems and wastewater treatment plants (about 58% from total investment value) (Authors’ elaboration). 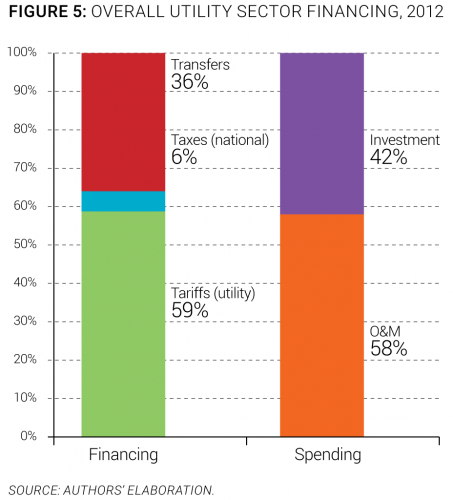 Tariffs are the basic funding source for investments, supplemented by the EU Cohesion Fund and international loans. Subsidies from the Slovak Environmental Fund are minor compared to EU funds. Infrastructure owners co-finance projects using traditional commercial loans, but only in justified cases in order to optimize available means and investment priorities. The rate of investment over previous years has remained relatively stable, except in 2010, when EU subsidies dipped to one-quarter of the 2009 level (Figure 7). Cost recovery. According to regulations in force in the water sector, all operational expenditure shall be covered by tariff revenues, and no national or subnational transfers are recorded. The Slovak Republic is making efforts to move toward full cost recovery for water supply and sanitation, as required by Article 9 of the WFD. Since 2008, all water consumers pay a unique water tariff, and there are no longer cross-subsidies between domestic and industrial consumers. Tariffs. The average residential tariff is €2.29/m3, which is among the highest in the region. Tariffs are increased by decision of the Regulatory Office based on proposals submitted by utilities. Between 2004 and 2012, tariffs increased by 168% (average yearly inflation of 3%), and the national average residential tariff is €2.29/m3, including the VAT (Figure 8). Regional differences exist, and dispersion of tariffs are statistically as high as €1/m3. The VAT rate of 20%, which is applied for water and sanitation services, is among the highest in Europe. Tariffs are still expected to increase in the coming years, since efforts will have to be made to fulfil Slovak commitments toward EU requirements, and to ensure water and sanitation facilities renewal. Affordability. The potential affordability of water services remained within an acceptable range of 2.3% of family income in 2012. Moreover, households in the bottom 40% potentially spend more than 3.5% of their income on water and sanitation expenditure (Authors’ elaboration). The economic regulatory framework in force in the water sector does not define any formal subsidy scheme to address affordability issues. Ensuring the affordability of water tariffs in the future. Tariffs are expected to increase in the coming years, since efforts will have to be made to fulfil Slovak commitments toward EU requirements, and to ensure water and sanitation facilities renewal. The investments planned until 2022 amount to €290 million per year. With water and sanitation expenditure representing more than 3% of the average income of the bottom 40% of the population, the affordability of water tariffs will have to be carefully monitored in the future. Improving the availability of structured, reliable and comprehensive data about the sector’s situation. In the absence of regulator-sanctioned data collection, there are presently no structured and comprehensive information giving a clear picture of the sector. As a result, utility managers cannot assess whether their operation is at par with good practices. Without reliable sector financing information, policy makers lack a key instrument to promote sustainable services, and sector planners, in the absence of consistent data about access to services, cannot ensure that limited public funds go to the most cost-efficient and cost-beneficial projects. Addressing this challenge would help the sector move ahead. Improving the cost recovery level of services. Tariffs cover operation and maintenance costs but not capital expenditure. Within a context of important investment needs, improving the cost recovery level may be required since EU Cohesion Funds and national subsidies may not cover all capital funding needs through 2022. MinV. 2015. Ministry of Interior of the Slovak Republic: Public Administration. Accessed 2015. http://www.minv.sk/?registre-evidencie-zoznamy-informacie-o-registracii. MINZP. 2013. Water Management in the Slovak Republic in 2012. Bratislava: Ministry of Environment of the Slovak Republic. —. 2014a. Situation Report on the Disposal of Municipal Waste Water and Sewage Sludge in the Slovak Republic 2011-2012. Bratislava: Ministry of Environment of the Slovak Republic. —. 2014b. State of the Environment Report of the Slovak Republic 2012. Bratislava: Ministry of Environment of the Slovak Republic. Stat SR. 2015. Statistical Office of the Slovak Republic. Accessed 2015. http://slovak.statistics.sk. This note has been prepared by Miroslav Klos, local consultant, with the support of Maria Salvetti, consultant, based on the data collection by Miroslav Klos. It is part of a regional State of the Sector review led by David Michaud, World Bank, under the Danube Water Program financed by the Austrian Ministry of Finance, whose support is gratefully acknowledged. The authors welcome comments and can be contacted through David Michaud (dmichaud@worldbank.org).